John appeared at the 5th Renown Pictures and Talking Pictures Film Festival at the St Albans Arena. This event had been sold out for weeks. 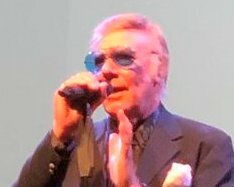 John appeared live on stage to interview Marty Wilde and Craig Douglas. Their movies are regularly seen on the brilliant Talking Pictures channel. Marty received a fantastic welcome and was in great form with his chat and he sang a brand new and poignant song of his called Eddie. In memory of the late Eddie Cochran. Craig made his first stage appearance for nine years. He had retired through ill health. Many fans from across the country turned up to see a rare appearance from him. There was a queue waiting to be photographed with him. Sean, John’s son, a recent father of twin boys, also made a stage appearance. He was first on to interview Glyn Baker, the son of the legendary actor Sir Stanley Baker. Others who appeared on stage included Robert Powell, Jenny Hanley, Anne Aubrey, Brian Murphy and Linda Regan.